Every now and then He Who Will Not Be Ignored surprises me by saying something that proves not only that he does listen to me, but also that he is capable of formulating new ideas. The latest instance of this occurred while we watched the Boston episode of Andrew Zimmern’s Bizarre Foods America (although I’m pretty sure the Boston title would be pronounced “b’ZAH”). During his visit to Clio restaurant, Zimmern saw chef Ken Oringer make powdered chorizo by mixing tapioica maltodextrin with rendered chorizo fat. He Who, who has seen me make powders out of caramel, peanut butter, and french toast, said “Dad, we have to make powdered buffalo sauce and serve it with chicken.” I don’t know if the orange color of the chorizo fat reminded him of buffalo sauce or if he just made the connection that fat can be converted to powder, but I agreed the we had to experiment with his idea. What follows is our experiment, with additional commentary from He Who. Not long after this conversation, The Boston Globe ran an review of Oringer’s newly-reopened sushi bar, Uni. 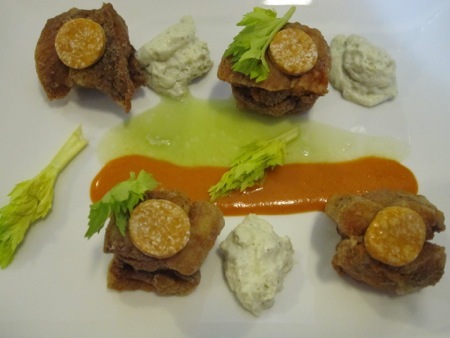 One of the new dishes was his take on tori no kara-age (deep-fried chicken nuggets), which in his presentation were uniform little cubes of chicken – an effect achieved by gluing chicken thighs together with transglutaminase. 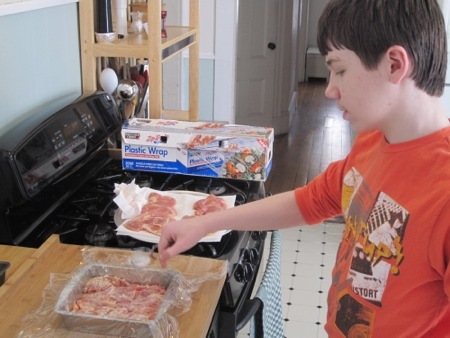 That’s where we began, layering boneless skinless thighs in a 8″ x 8″ plastic-lined baking pan. I taught He Who how to season by sprinkling salt from high above the food for more even distribution. He dusted transglutaminase over the first layer and on the thighs waiting to become the second layer. We wrapped the chicken in plastic, set a second pan on top, weighed everything down with a brick, and let it sit in the fridge overnight. 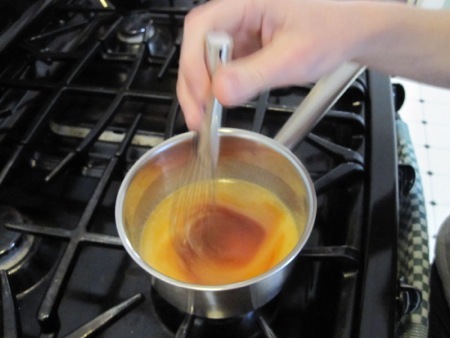 We made our own buffalo sauce by combining a half cup of hot sauce (Frank’s Red Hot) with four tablespoons of butter, a tablespoon each of dark brown sugar and cider vinegar, and two tablespoons of Tabasco. I sneaked in some extra salt and pepper when you weren’t looking. While the sauce cooled, we made a celery emulsion by juicing and straining six celery ribs which we blended with half a gram of xanthan gum. We also made a blue cheese sauce by blending and straining cheese, cream, milk, and olive oil. 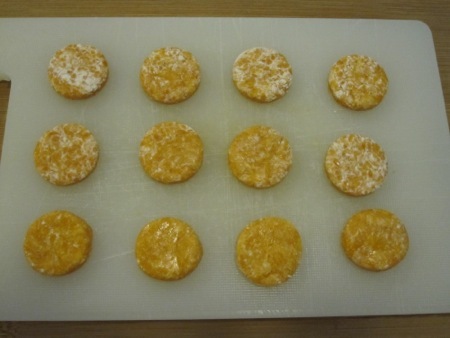 We poured the mixture into an ISI canister, incorporated two cream chargers, and refrigerated until needed. 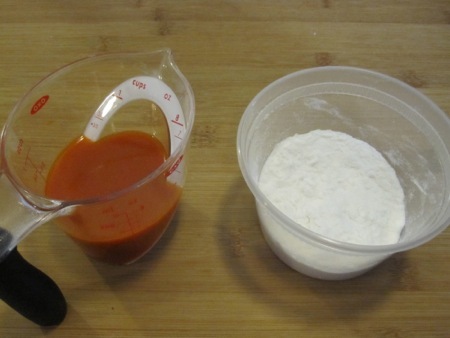 To make the buffalo sauce powder we began with equal volumes of sauce and maltodextrin, half a cup each. The sauce handily absorbed the powder and showed no signs of thickening. After three more half-cup additons of powder the sauce had thickened to the consistency of ketchup. At this point we halved the working amount, continued to add maltodextrin, and eventually wound up with a coarse powder. Unfortunately, after five minutes the powder turned into a thick, sticky mass. We set it aside while we worked on the chicken, which was now a solid block. We cut it into smaller blocks which we dredged in cornstarch seasoned with cayenne and black pepper. 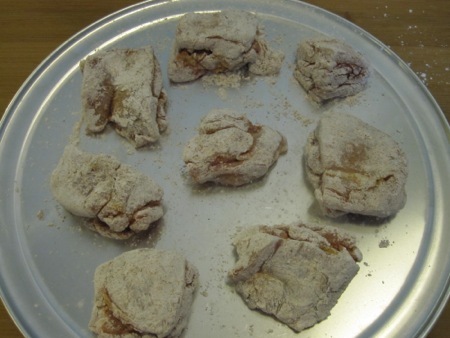 While the chicken spent time in the deep fryer, we returned our attention to the failed powder. 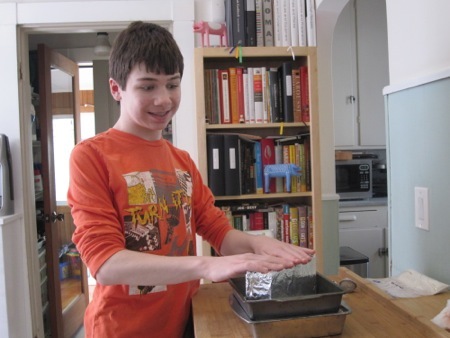 This is when He Who had another brilliant idea: “It’s like taffy. Roll it out and cut it with a circle cutter.” Which is exactly what we did. To plate, we used some of the remaining thickened sauce, striped the celery emulsion next to it, and arranged the fried chicken. Each piece was topped with one of the sauce discs, and we finished by piping out some blue cheese mousse and adding pieces of celery core that resembled miniature stalks. I wish the chicken looked more like fast-food fried chicken. We discussed why the sauce had failed to turn into powder. 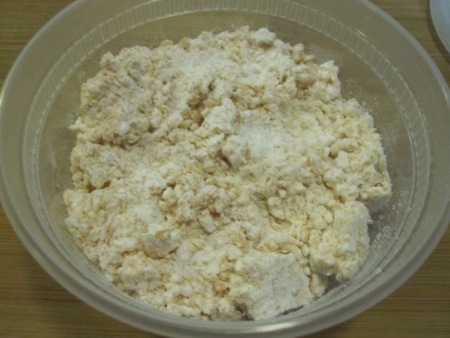 Maltodextrin works best when mixed with something that is almost pure fat like caramel or peanut butter. Our homemade sauce was mostly water from both hot sauces as well as the vinegar. Maybe we should have started with pre-made buffalo sauce instead. If we had reduced the sauce down to a syrup before adding the matodextrin, I’m sure we would have succeeded. Of course, there’s only one way to be sure, so look for that result soon. *It’s a grammatically valid English sentence. I’m thinking–this being right up my geekery alley, of course–that if you used citric acid or vinegar powder and cayenne powder then you could make brown butter powder with the malto and add sugar so all the non-fat flavors would already be dry. 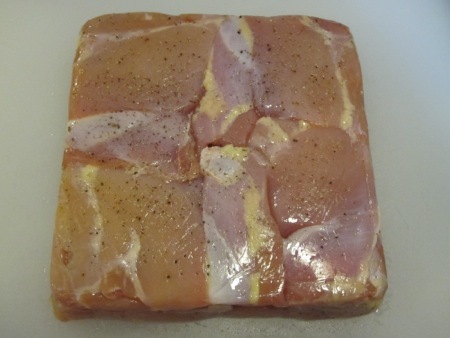 You could also use Activa YG (the dairy one) to make a firm blue cheese mixture and layer that between the chicken before molding overnight. In any case, nice one. 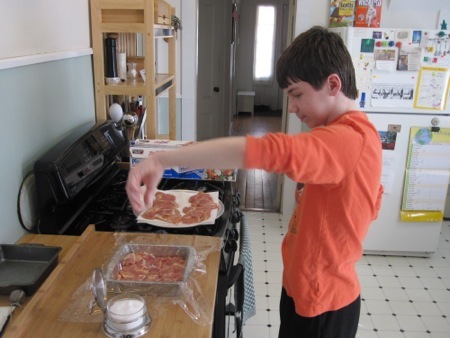 I’m working on a post about genius kid cookery myself. Those are both great ideas. 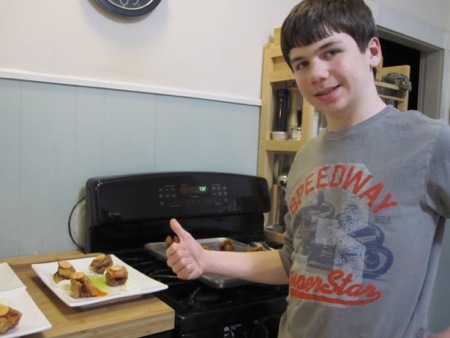 I found a buffalo wing recipe that required making chicken croquettes and filling them with a chicken/blue cheese mousse, but I like your suggestion better. Now I’ll have to save up for a second batch of Activa. RM works fine for dairy, really, at about 1% by weight, but Modernist Pantry sells small bags of the various Activas for correspondingly reasonable prices. Now that I think about it, what would prevent the cheese layer from melting out dying the deep fry? There’s no outer batter, just a cornstarch dredge. The activa impedes melting. I’ve made ricotta gnocchi this way (piped out onto parchment in fridge overnight) and then browned them hard in a pan with no loss of shape. Also, just to be clear, my pink frowny star is mad. I didn’t pick out your frowny star, but you should consider creating an avatar from one of your paintings.